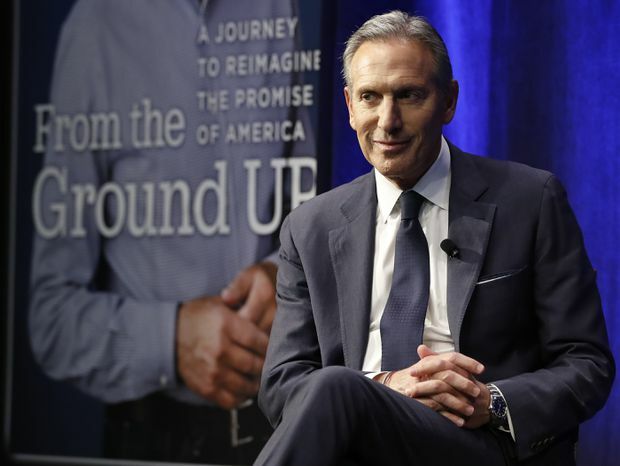 In this January, 2019, file photo, former Starbucks CEO and chairman Howard Schultz looks out at the audience during a book promotion tour in New York. For too long, the state has been going super soft on the super rich. So says the Democratic Party, which is vowing to bring an end to that era. To that end, it’s rolling out several different tax schemes targeting billionaires and near-billionaires. The rich guys, of course, are irked and indignant. They contend it’s un-American to stop anyone from raking in as many billions as they wish. Well, that might have once been the case. But opinion polls show a shift in attitudes. Americans are becoming fed up with the power exercised by the ultrawealthy, and the Democrats are poised to take advantage. The party’s more radical wing is riding a lot of momentum these days. It is pushing not just the tax crackdown on billionaires, but other left-side policies such as free college tuition, medicare for all and, on the environment, a Green New Deal. If the new class gains control – and there’s a good chance it will – the United States will have a Democratic Party that’s more radical than any since the 1972 version led by George McGovern which, party members don’t like to be reminded, was eviscerated by Richard Nixon in the election of that year. Leading Democrats in Congress such as Elizabeth Warren, Kamala Harris and Alexandria Ocasio-Cortez, as well as the apologetically left-wing Independent Senator Bernie Sanders, have been making the argument that the country is drifting toward economic oligarchy. Ever since Ronald Reagan’s presidency in the 1980s, the argument goes, income has been redistributed upward instead of down, and economic policy-making that favours the wealthy and corporations has ushered in glaring income disparities across the land. These are oft-cited economic laments. What’s different now and what’s raised resentment is the outsize influence that the ultrarich are exercising in the political sphere. In 2010, a landmark U.S. Supreme Court decision deregulated election campaign spending. Since that time, billionaires or their near-equivalent have been running for president, funding campaigns, founding think tanks, buying up media and buying off legislators. The uber-wealthy Donald Trump surrounds himself with a cabinet of the super rich. To date, it has provided little evidence that bucks and brains have much in common. The United States has 400 billionaires whose combined wealth is more than the GDP of France. The average age of the top 100 billionaires – almost all white males – is 70. The richest 1 per cent in the country now own more wealth than the bottom 90 per cent. Ms. Warren has unveiled a plan for a wealth tax of 2 per cent on the country’s 75,000 richest families. Mr. Sanders has proposed a significant increase of the estate tax on big inheritances. Ms. Ocasio-Cortez has put forward a new marginal tax rate of 70 per cent on income more than $10-million made in a single year. And rather than being seen as radicals, Americans are buying in. A new Politico/Morning Consult poll released this week, as well as a recent Fox News poll, showed overwhelming support for more taxes on the wealthy. Even among Republicans, a majority are in favour of making the rich pay a greater share. Meanwhile, Starbucks owner Howard Schultz, who has no political experience but is prepared to spend hundreds of millions to try and win the White House, calls Ms. Warren’s tax plan “ridiculous” and Ms. Ocasio-Cortez’s position on billionaires “un-American.” For his efforts, his campaign is enjoying a favourable rating of just 4 per cent, according to Change Research. Billionaire Warren Buffett has a different perspective. He says "My friends and I have been coddled long enough by a billionaire-friendly Congress.” He wrote this many years ago, even before Mr. Trump gifted a tax cut to the moneyed and corporate classes. The super rich could now face a period of reckoning. These new Democrats appear to have the wind in their sails. They want to replace the neo-liberalism of the post-1980s with an economic paradigm which redistributes downward instead of up. It’s a tall order. Making the coddled class pay a larger share is necessary start.